Polaris Outlaw 450 MXR Updated Review. 2010 was the last year for the Outlaw 450 MXR. The Polaris Outlaw 450 MXR is the thoroughbred racer of the Outlaw line up. It had several updates for the 2009/2010 model years, then was dropped beginning with the 2011 model year. 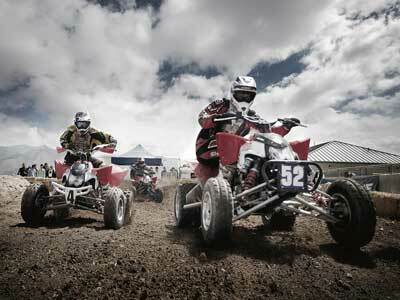 As of 2013, Polaris doesn't offer any racing oriented sport ATVs. There may still be some left over Outlaw MXRs new in the crate, so for that reason, we'll detail all the changes for the last model offered. Lower seat height and shorter rear shock for a lower center of gravity and more stable handling. Hydraulic clutch for easier, more consistent shifting. Good power from the bottom to the top. Quick off the line for good starts. Suspension works well enough stock with plenty of adjustability. Fox Podium shocks with reservoirs on the front will do the job. Maxxis Razr tires are good enough to start with. Overall, a balanced package with all the basics you need to go racing. Some premature front wheel bearing failures have been reported. Truthfully, talking to actual owners, very few had anything negative to say about the Polaris Outlaw 450. And that says a lot! "I love my Outlaw. It is quick, easy to handle and has tons of low end torque. It is great." "I have to say this is one of the first machines I have ever owned that lived up to the hype. I have done everything from trail ride to race arena cross with mine and have never been disappointed. It is extremely nimble on the open trails and is very predictable in the air. Home run in my book." "The power is always there and I was able to come out of the hole every time with the guys that are cammed and punched out. It jumps great and is very forgiving when you overshoot or come up short." "I have never ridden a faster off-the-line quad ever. This thing rips. The top end leaves a little to be desired but it is a great all around machine. I had only one problem with it. The day after I brought it home it lost a retainer holding one of the starter gears on. It took the dealer about 4-5 days to get it fixed. It is the longest 4-5 day wait that I have had in a while. Since then I have had zero problems." Looks like the Polaris Outlaw 450 for 2009 builds on last year's model with some changes and tweaks that racers requested. Owners that we interviewed seemed pretty happy with the basic package. 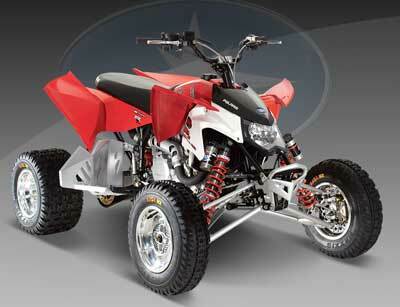 Any racing ATV will need to be tuned and honed to fit an individual rider's needs. The thing you really look for is if all the parts are there in the first place. In this case, it looks like they are. We believe an average racer could take the Outlaw 450, and with some adjustment to fit their riding style, be competitive. Polaris Outlaw 525 IRS - The Polaris Outlaw 525IRS is an evolution of the sport ATV that pioneered independent rear suspension - the Predator. Now with a hot rod KTM engine and first class suspension, Polaris threw some new tricks at the 2009 model. Polaris Outlaw 525 S - The S stands for "sand" - but this ATV will work in the woods or on the track too. Polaris 4 Wheeler Parts - Where to Find the Best Deals on Polaris Outlaw 450 Parts.